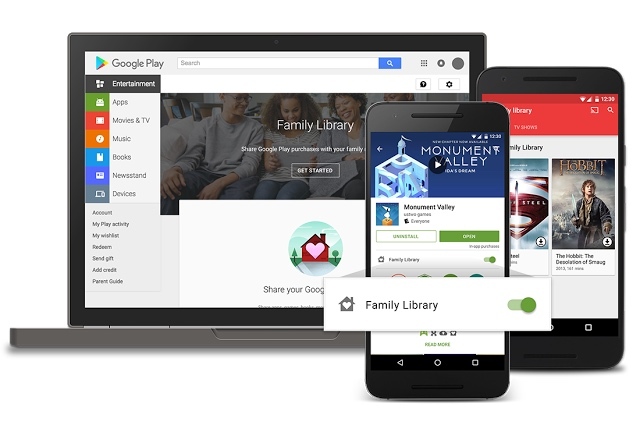 Google this morning announced "Family Library" for Google Play that allows six family members to share their online purchases from the company's stores across devices. The new program means movies, TV shows, and books can be shared by families on iOS devices and the web, as well as over connected TV platforms like Roku and Smart TVs, with no sign-up fee required. Starting today, Family Library is rolling out over the next few days and will be available in Australia, Brazil, Canada, France, Germany, Ireland, Italy, Japan, Mexico, New Zealand, the U.K. and the U.S. Meanwhile, up to six people can continue to share streamed music using Google Play Music's existing $14.99-a-month family plan, which today expanded to Ireland, Italy, Mexico, and New Zealand. Users of Family Library can access a new setting in the Play Store, where one person is designated "Family Manager" and they can then add other members. Member purchases are shared by everyone by default, although an option to selectively share purchases is also available. Lastly, the system supports pre-configured Parental Control settings on children's devices, and parents can approve purchases requested by younger family members. A billion other people didn't. I find your comment a great deal more objectionable than his. That was my point. Apple should add the ability to allow additional credit cards for family members. The cross platform sharing wouldn't hurt either. It is too bad they were so late to the party. I ditched my android phone because of this. Funny thing. I may live in the only house in America where no one has any interest in playing Pokemon Go. This is a house with a 10 year old and a soon to be 17 year old. The only thing I see missing is allowing additional credit cards for family members for Apple Family Sharing. You can make purchases private with Apple and family members can use gift cards to make purchases directly without billing the master credit card (my kids do this all the time as they're always getting iTunes gift cards for Christmas or birthdays. The approval option is also there with Apple.